Ever since I first heard David Bowie's "Space Oddity" I have longed for a modern film that captures the way that song makes me feel. Ground Control to Major Tom, your circuit's dead, there's something wrong. Can you hear me, Major Tom? Can you hear me, Major Tom? There is something about being lost in the desolation of outer space that I find equal parts horrifying and beautiful. Duncan Jones' Moon was damn close but I also wanted to see the terror and impending madness that comes with floating into the darkness off-structure. 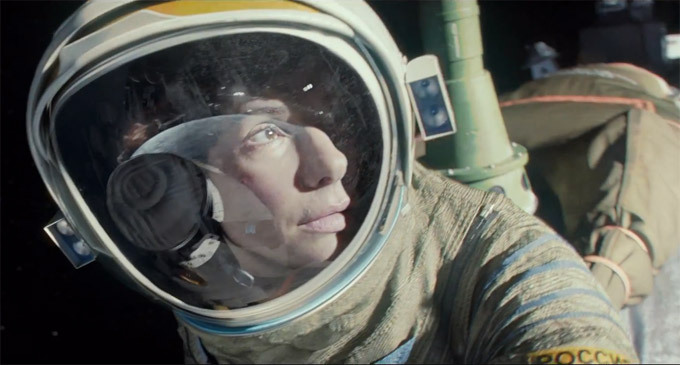 Well, my wish for such a film has been fulfilled by Alfonso Cuarón's latest, Gravity. It is a harrowing tale of survival in mankind's least understood and most dangerous frontier - outer space. It may also be the best film of the year. Dr. Ryan Stone (Sandra Bullock) and astronaut Matt Kowalsky (George Clooney) are on a routine repair mission hundreds of miles above Earth when unexpected space debris hits their shuttle, leaving them stranded and incommunicado. With oxygen running out and panic setting in, the pair struggles to survive the ordeal and make it home. The on-screen cast of this film is comprised only of Bullock and Clooney. 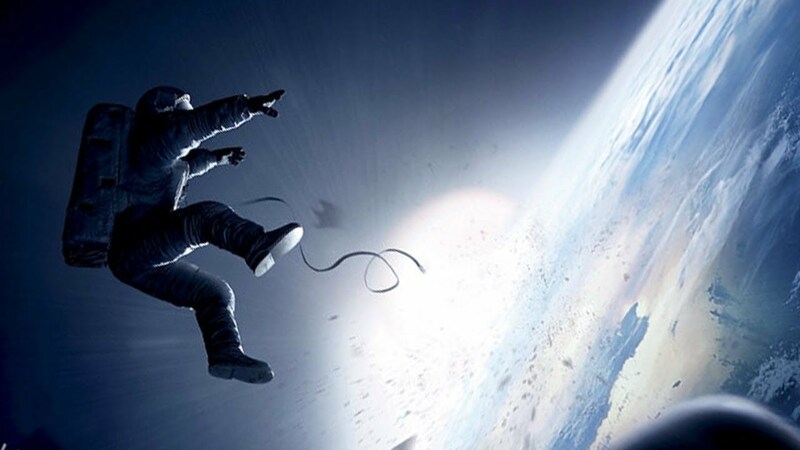 In fact, a lot about Gravity is minimalistic: few characters; a lack of ambient sound; even minimal editing (Cuarón loves those long takes). It's no wonder since outer space is essentially nothingness. It is huge and expansive but completely devoid of noise and matter. So too is this movie epic in scale but filled with moments of absolute silence and calm. The film moves at a gradual pace, as you would too if you were free-floating in space but it is never, ever boring. One major aspect of the film that is anything but minimal is the VFX. More often than not, films set against a digital background look awful, unrealistic, and distracting (paging The Phantom Menace). With Gravity, not once did I doubt what I was seeing. The visual effects and cinematography are jaw-dropping. When this film was in theaters, I insisted everyone see it in 3-D, or even better in IMAX. Sweeping long takes, POV shots, and flawless CGI pull you into this beautiful but deadly world, and the 3-D enhanced all that three-fold. On a home entertainment system, the film certainly loses some of that power but not much. Watch it on a big TV with the lights out to replicate that dark theater vibe and you'll still feel trapped right there with the astronauts. While watching this film, on more than one occasion I realized I had stopped breathing and my fingers were clenching my seat. Gravity is one tense (if not downright scary) film, and it all feels so real that if somebody told me this was based on a true story, I would believe them. Think of it as science non-fiction. There is no need for xenomorphs or HAL here. Instead, the film capitalizes on our natural fears, like abandonment, loss of control, darkness, feeling trapped, and suffocation. There is also a lot of human emotion in the story through Dr. Stone's own haunted past and persistent inability to "let go." Her journey home is not only a literal one but an emotional rebirth and a reclaim on life. In the lead role, Bullock is fantastic while Clooney brings his usual charm (even if his character largely exists to support Dr. Stone's story). Honestly, both performances are dwarfed by the stunning visuals and sheer scale of the film. A few lines of dialogue are a bit cheesy but only in a summer blockbuster kind of way. They would be totally passable in a normal film but for one so brilliant and gorgeous as this, my standards are admittedly exorbitant. This is a very, very minor complaint about an otherwise perfect movie. To reiterate, I highly recommend watching it with the best atmosphere you can create so you can take full advantage of its visual prowess. With constant intensity and unmatched beauty, Gravity satisfies as both an action-filled blockbuster and as a cinematic masterpiece. Gravity is now available on DVD/Blu-ray combo pack and DVD/Blu-ray/Blu-ray 3D combo pack. This review pertains to the non-3D version. The feature is presented in 1080p HD with aspect ratio 2.4:1 and DTS-HD Master Audio 5.1. The special features include some incredible behind-the-scenes footage that you need to see! On the Blu-ray, there are fourteen different featurettes detailing every aspect of the work put into making this incredible film. It took four years and a staggering amount of talent to create the final product. The nine "Gravity: Mission Control" featurettes discuss everything from the original script; the challenges of recreating zero-gravity conditions; every step of the arduous animation process; lighting; music; practical FX; and more! Then there are five "Shot Breakdown" featurettes that show how the film's most challenging sequences were pulled off. The Blu-ray also includes 22-minute documentary called, "Collision Point: The Race to Clean Up Space" narrated by Ed Harris and directed by Alfonso Cuarón. Both the DVD and Blu-ray include co-writer Jonás Cuarón's fantastic short, Aningaaq, which shows the mayday conversation in Gravity from the perspective of the other end. It's a fascinating short in its own right but especially wonderful when you see how it connects to Alfonso's film. All in all, there are nearly three hours of special features and they are well worth the money if you enjoy Gravity or filmmaking in general. The amount of skill and ingenuity that went into making this movie left my jaw open. The movie was essentially made backwards (animated and edited largely up-front before production had completed), and there are techniques and devices that were pioneered exclusively for this project. If you want to be wow'ed, watch these special features! You can pick up either combo pack using the links below!